Penn and Lehigh have a long history of playing each other in football. They’ve never been rivals in the truest sense of the word, but their football programs are almost the same age, they both have a big focus on academics, and they’ve faced each other on the gridiron often. It’s difficult to put into words what a Lehigh football game with Penn really means. Though there isn’t really an official Patriot League/Ivy League challenge “series”, both conferences have teams that face off against each other often, but what is the significance of these matchups? Fortunately, S Sam McCloskey, perhaps inadvertently, perfectly voiced what the Penn game has been to Lehigh in the past two years. That sums up exactly what this game is, and has been – a chance for either team to make a statement. For both teams, it’s a chance to make a statement in a key spot early in the season that they belong in the conversation about the best teams in the East. And for many, like McCloskey, he has a keen memory of what happened the last two times they faced off against Penn. One memory was a tremendous moment – the other, not so much. In 2016, Lehigh beat the Quakers and propelled themselves from the momentum of that win and swept their way rest of their schedule undefeated. Down 28-21 in that game at Franklin Field with 1:14 left in the first half, head coach Andy Coen elected to put the offense back on the field and put them in the two minute drill to make something happen. The Mountain Hawks drove to the Penn 2 yard line and stopped the clock with 0.3 seconds on the clock. RB Dominick Bragalone ended up making one of the key blocks to break QB Nick Shafnisky an opening to score a touchdown on the last play of the half, tying the game and seemingly giving a shot of momentum through the entire game, Lehigh eventually winning 42-28. It was a moment and a win that the 2016 Mountain Hawks would talk about often during the course of that Patriot League championship season. That moment, and that game, was the moment they knew they were a special team. In 2017, Lehigh fans were hoping for a similar momentum-spurring moment for the Mountain Hawks to get them prepared for Patriot League play. Unfortunately for Lehigh, the opposite happened. When the scoreboard operator at Murray Goodman Stadium was finished, it read Penn 65, Lehigh 47, and in the process the book was closed on the highest-scoring game in the 142 year history of the Quaker football program. 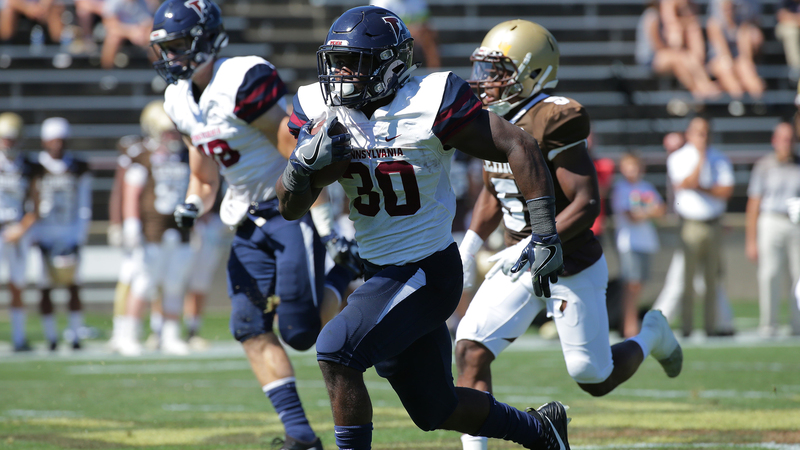 Penn gained 615 yards of total offense, with RB Karekin Brooks running for 268 yards and 3 touchdowns and QB Will Fisher-Colbrie throwing 4 touchdowns. The biggest force stopping the Quakers that day might have been themselves, as they had 10 penalties for 125 yards, including one that negated a 68 yard rushing touchdown that would have made the final score even higher. The monumentally high-scoring defeat kept the Mountain Hawks reeling through the rest of their out-of-conference games, contributing to a 5-6 record. Worst, it gave Lehigh the reputation of having a bad defense – a reputation that the defense has struggled to overcome over the course of last season. Though Fisher-Colbrie has graduated, Brooks might be licking his chops at seeing the Lehigh defense again this year as well. But the Mountain Hawk defense has shown a lot of signs that the struggles of 2017 are behind them, most notably the fact they only gave up 50 yards on the ground to St. Francis (PA) in Week 1 of the season. In the end, the game at Franklin field this weekend pitting Lehigh and Penn will be, once again, about statements. The team that wins will not only help establish Patriot League or Ivy League supremacy, they will also be in a good position to achieve their championship goals on the season. The team that loses will have to find a way to right things before conference play.